Finished! 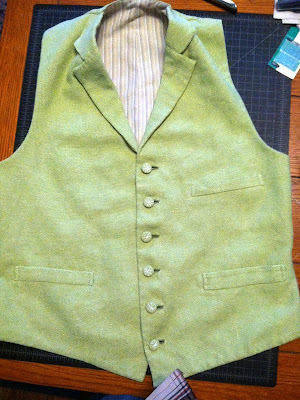 I like this waistcoat quite a bit. It fits very nicely, high under the arm in the armscye, which will give me good ease of movement. I know I haven't shown myself wearing any of the things I've finished recently, but once I have a whole outfit put together I'll wear everything at once. This is the first time I've used silk thread for buttonholes. I have to say it's quite nice to work with. The only problem with these buttonholes is that the linen unraveled so easily. I had to do some thick overcast serging with regular thread before moving to the silk twist. It looks lovely! Did you sew this entirely by hand? Nice to see you here, Peter! I did sew it all by hand. Since starting this blog my sewing machine pretty much lives in the basement and I don't take it out much anymore. Though I do want to make a pair of jeans soon, so it'll have to come out of retirement. Just discovered your blog at Britex. Thanks for the links to the fine books that you are using to learn tailoring yourself and for taking the time and effort to post your progress. Bravo on your vest! Many thanks from a fellow handsewer. I've always loved making things. Anything, everything, as long as I was working with my hands. Two years ago I started making historical clothing for my wedding - I made a Victorian suit and top hat for myself, and I made my wife's Victorian dress and top hat. Since then I've kept making historical clothing, trying to teach myself to make them better and more accurate. I've found all sorts of blogs about historical clothing, but very few with information about men's clothing. Those that do are almost all written by women who sew for the men in their life. My goal is to have a blog about men's clothing made by a man. I'm learning as I go, but I hope to be a formidable tailor at the end of my journey!